This summer, more than 50 iOgorod garden beds were rented. Source: Courtesy of Synergy Innovation. The iOgorod project enables anyone to rent a vegetable patch and watch their eco-friendly meals grow online. iCucumbers and iTomatoes are priced five times higher than the vegetables for sale in stores, but there is still a strong demand for them. Gardening is no longer a survival skill in Moscow. Now, it is an elite service offered to the wealthier enthusiasts of a healthy lifestyle. Nearby Moscow, the greenhouse complex in the village of Ostrovtsy is running the iOgorod project, which enables patrons to rent a vegetable patch and use a webcam to watch professional agriculturists take care of the crops of their choice – from tomatoes and strawberries to arugula and basil. A courier then delivers the harvests to customers’ front doors. The idea for this semi-interactive kitchen garden belongs to Vadim Lobov, head of the venture capital fund Synergy Innovation. In the spring of 2011, the fund invested $1 million in the project, rented a greenhouse, brought in soil and installed webcams – and iOgorod became operational. These days, shops are filled with vegetables cultivated on fiberglass and hydroponics, as well as fruits treated with methane to speed up ripening. For this reason, the founders of the project believe that everyone should be entitled to fresh and ecologically pure vegetables and greens. They opted for organic farming: iOgorod specialists apply no chemical herbicides and pesticides, use artesian water and apply only non-chemical fertilizers. This is not a cheap service, however. The project charges a monthly fee of 6,000 rubles ($190) per 64.5 square-foot bed, and members have to wait about six months before they can eat their own tomatoes and cucumbers. iOgorod customers pay a monthly fee of 1,000 rubles ($32) per 10 square feet; a single bed is normally 64.5 square feet. Specialists harvest 44-55 pounds of tomatoes, 33-44 pounds of cucumbers and 2.2 pounds of parsley per season (six months). The owner therefore pays 120-150 rubles per pound of tomatoes, 150-200 rubles per pound of cucumbers and 500 rubles per pound of parsley. In Moscow markets, tomatoes are available at 15-50 rubles per pound, cucumbers at 20-50 rubles, and parsley at 35-50 rubles. This summer, more than 50 iOgorod garden beds were rented; however, the number has fallen below ten, now that the season is over. “The season has finished, and many of the crops, such as strawberries, peppers, cucumbers and tomatoes, can’t be cultivated at this time of year. But cucumbers and tomatoes are believed to be the staple vegetables in Russia. This is part of the national mindset – people can’t do without them,” Medetsky said, adding that Moscow has an estimated 30,000 potential iOgorod customers. Medetsky has two displays in his office that stream videos from the greenhouse. At around 12 o’clock, customers arrive. There is a woman and her son, who called earlier to say they wanted to plant the seeds themselves. They soon get busy planting the seeds, clumsily yet arduously. This is how wealthy families get “back to their roots” these days. You can plant the seeds with the Happy Farmer application on Vkontakte. Source: Courtesy of Synergy Innovation. Medetsky admits that iOgorod is not a real business scheme for Synergy Innovation – it is more of a hobby. “You know, no one does organic farming in Russia for real, and there are few such farms in the world, because this business is extremely unprofitable. We won’t ever be able to compete with mass producers of vegetables that use industrial cultivation methods,” he said. Medetsky stated that start-up investments have been disbursed, but the project will only break even in 5–7 years at the earliest. Nevertheless, the fund is thinking about inviting new investors to iOgorod. “We need another $5 million to rent additional greenhouses, expand our production and maybe open new greenhouses in Vladimir Region, where everything is much cheaper, albeit with higher logistics costs,” Medetsky said. 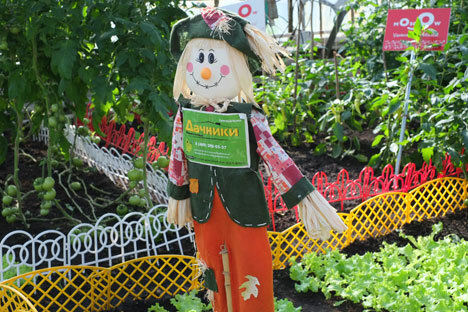 He is confident that eco-foods have great potential in Moscow.